The story of Sottile red is a tale of total disaster averted, then tragic loss and, finally, the spirit of a community coming together for a good cause. And that was way before October 2017. It all started Nov. 6, 2014, when an accidental structure fire broke out in the charity-driven Bon Marche thrift store. The fire threatened the adjacent Sonoma Spring Brewery, which was just getting back on its feet in the Riverside Drive building after being out of production for a year, until 30-plus firefighters showed up at the three-alarm blaze. "They basically saved our bacon," says brewery partner Derek Drennan. The following October, with tap room open and head brewer Tim Goeppinger's kettles steaming with his signature Sonoma-style, German-influenced brews, the brewery invited the local fire department to help make a beer with them that would benefit the Sonoma Volunteer Firefighters Association. They liked the idea, and chose a red ale because, well, fire department—but also because they preferred the brewery's stronger Lil Chief and SonomaComa ales, for the originally named Firehouse Red. But while Goeppinger's custom double American red recipe brewed, Drennan's main point of contact for the November 2015 release party, a volunteer firefighter named Lino Sottile, suddenly passed away in his sleep. "He was a good guy," says Drennan. "He was a regular customer of ours, he was a home brewer, and he was super-excited about this event." The beer was renamed to honor Sottile, and the event—now part-wake, part-celebration—was well received by Sottile's family and the community. The event expanded in 2016, with firefighters selling brats and T-shirts while a band played in the parking lot. This year, says Drennan, "it's taken on a whole new meaning—for obvious reasons." 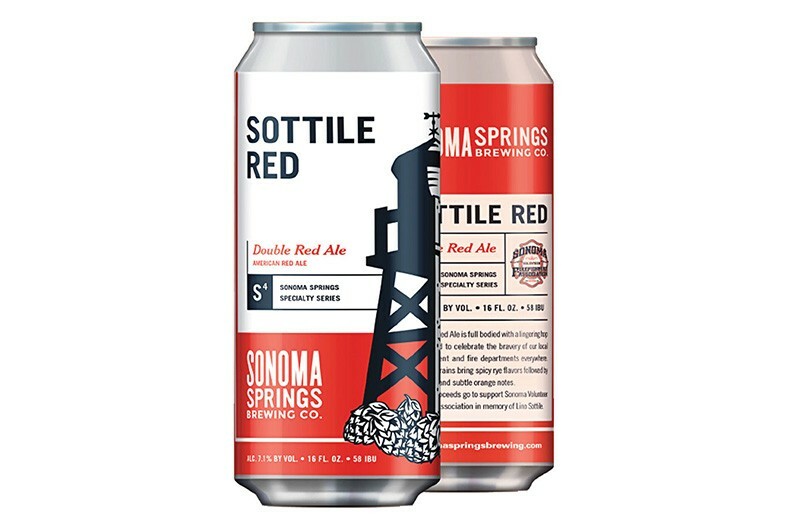 And you don't even have to show up to the release party, tentatively scheduled for Nov. 11, to benefit the Sonoma Volunteer Firefighters Association with 10 percent or more of beer sales: this year, Sottile red ale will be available in cans in local markets. 19449 Riverside Drive, Ste. 101, Sonoma. The first time I walked into St. Florian's Brewery, a tour of the brewing facility revealed heaps of clothes and other donated items stacked around the tanks, destined for victims of the 2015 Valley Fire in Lake County. St. Florian's, founded by Amy and Aron Levin, already donates a minimum 5 percent of its profits to firefighting and community organizations, Now they're teaming up with local breweries like Crooked Goat, Bear Republic, Fieldwork and others throughout the area and beyond, to make a brew in the Sonoma Pride program spearheaded by Russian River Brewing Company. Incredibly, the brewery has already held a fundraiser event this month—while brewery Aron Levin, who is a Windsor firefighter, was on the lines for the Tubbs and Nuns fires. Named for the patron saint of firefighters, St. Florian's makes a malt-forward yet dry and robust style of "Flashover" IPA and other ales. 7704 Bell Road, Windsor. 707.838.2739. Annadel pale ale is the signature beer of this Santa Rosa favorite, and that reminds us of Annadel State Park, which has reportedly suffered 75 percent burning. What has become of the trails that so many love to hike or ride? "That's definitely at the top of our minds," says Third Street Aleworks brewmaster Tyler Laverty, who flew back from a business trip to the Great American Beer Festival at the end of the weekend only to be evacuated from his house later that night. Several years ago during the state park funding crisis, Third Street stepped up, and while a benefit of some kind for the park is still in discussion mode, says Laverty, the brewery's patrons raised $3,191 in the last few weeks with $1 of each pint sold. Next, Third Street's own Sonoma Pride IPA is due on tap in the second week of November. Laverty credits Russian River's Natalie and Vinnie Cilurzo for getting two malting companies to donate bags of two-row malted barley, which is essential to brewing, to get the suds started. Then, one of Third Street's hop suppliers reached out just to see how they were doing, and ended up shipping them two boxes of hops, gratis. Thus, 100 percent of the proceeds of the upcoming IPA will go to Levi Leipheimer's King Ridge Foundation, which also helped out after the Valley Fire. 610 Third St., Santa Rosa. 707.523.3060. Not only has the brewery moved fast to repurpose its Sonoma Pride trademark for a collaborative series of benefit beers, it's also holding a raffle offering Pliny fans from far and away line-jumping privileges during the next frenetic Pliny the Younger release in 2018. Sorry—I should have said, "line-cutting privileges," as I know that many folks, including myself, don't want to hear about anything that's jumping a line, anytime soon. The raffles will be held Nov. 13–15, and each day Russian River will draw four names of who'll get a fast pass to taste that curiously quenching triple IPA. 725 Fourth St., Santa Rosa. 707.523.2337.